The officers' baby boys and girls ranged in age from eight days to six months old. A series of Facebook photos that captured the moment seven Kentucky police officers posed with their newborn and infant children has gone viral. Vicky Puckett with HUEit Photography by Vicky Lea captured the touching moments in a two-hour photo shoot after the wife of a detective reached out to her. "When one of the wives realized that they were all having babies, she wanted to capture it," Puckett told NBC News. “She thought it was therapeutic." 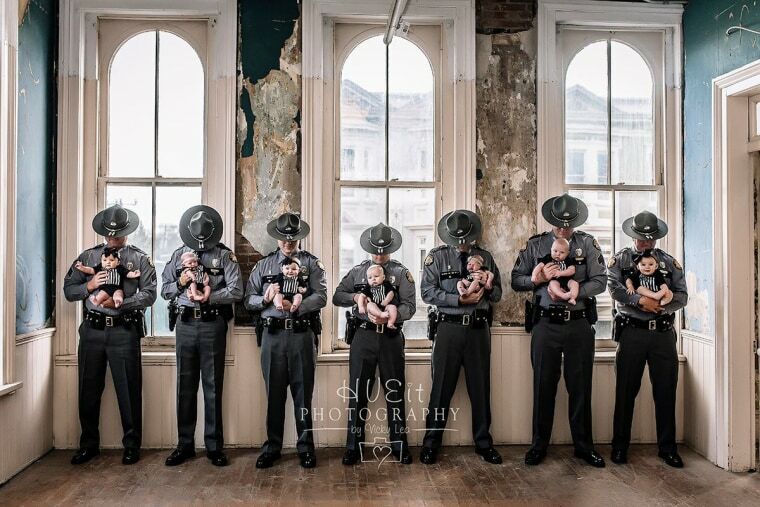 On a Sunday afternoon in Georgetown, Kentucky, the seven state troopers and detectives and their partners and babies all came together for the shoot. Puckett said the babies, who ranged in age from eight days to six months old, were dressed in special black onesies with the American flag on the front. Each officer's number was written on the back of their baby's onesie. Puckett said working with the pint-sized models was a little challenging, but also rewarding. Puckett said she expected the photo to get some attention online, but didn't expect it to go viral. She said she is glad the images are getting attention because they show a different side of the troopers and detectives who spend so much of their time protecting their community. "They have these adorable babies they come home to, and we sometimes forget that,” Puckett said. Detective Tye Chavies, who recently welcomed a baby boy with his wife, told NBC affiliate WLEX that he thinks the photo shoot was a good opportunity to "humanize the badge a little bit." "I didn’t think about it when we took the picture, but it kind of reminds us all the reason we go out every day to work, and definitely the reason why we’re coming home,” he said.